Networks and the security threats that plague them are constantly changing - and traditional network security solutions are no longer capable of sufficient protection. This is a fact that network security professionals and vendors can no longer afford to ignore. 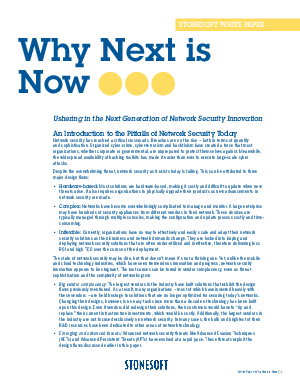 Making incremental improvements to traditional network security solutions - then calling them "next generation" - is not the answer. What is required is a fundamental change in the way security solutions are architected and delivered. The best protection against today's network threats are solutions that are adaptable, dynamic, easily managed, contextually-aware and affordable. Most importantly, these requirements must be met while also providing enterprise-class security.